Scrupulosity: A condition wherein an individual tends toward an obsessive conviction that they are guilty of a given sin even after receiving valid absolution and / or they tend to impute a far greater degree of gravity to their venial faults than prudence would suggest. Even after another individual is truly forgiven of their offense by the proper authority, the SP sufferer has difficulty accepting that this is indeed the case. The SP sufferer also tends to impute greater gravity to the faults of others than prudence would suggest. He demonstrates an attachment to his own opinion which makes him unwilling to abide by the judgment of those superiors who have every title to deference. 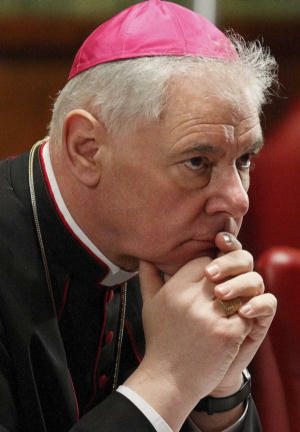 A good real world example is Archbishop Gerhard Müller relative to his treatment of the SSPX. Unfortunately, the interviewer failed to ask an obvious follow-up question; namely, what exactly is a “Church partner,” and why is the SSPX disqualified from being considered one? Thirty years of separation? Not according to my calculations. In 1988, Archbishop Lefebvre consecrated three bishops without papal mandate, and so he, co-consecrator Bishop Antônio de Castro Mayer, and the three priests who were consecrated incurred the penalty of “excommunication,” the formal term for suffering “separation” from the Church. Even so, Archbishop Müller apparently struggles to accept the judgment of his superior in the matter. In any event, let’s now examine why, in the archbishop’s estimation, these not-quite-partners find themselves in this “separated” position. So, what does Vatican I have to say about the Pope? Since the Roman pontiff, by the divine right of the apostolic primacy, governs the whole church, we likewise teach and declare that he is the supreme judge of the faithful, and that in all cases which fall under ecclesiastical jurisdiction recourse may be had to his judgment. The sentence of the apostolic see (than which there is no higher authority) is not subject to revision by anyone, nor may anyone lawfully pass judgment thereupon. This is particularly interesting given the archbishop’s insistence, contrary to the actions of Pope Benedict XVI in 2009, that the Society is “separated” from the Church and has been for thirty years running. For the record, I’m not a member of the SSPX, neither am I their spokesman or apologist, but I do have enough knowledge of what they profess to say that Archbishop Müller provided no specific evidence that the SSPX denies even the smallest portion of “the complete doctrine of the Catholic Church” for one simple reason; there isn’t any. Of course, this is not so much a matter of “scrupulosity projected” as it is calumny, but it is noteworthy in that it presumably sheds light on why Archbishop Müller feels justified in speaking of the SSPX as though the excommunication has never been lifted. Did you get that? “All that Vatican II said” is binding! A question has arisen regarding the precise theological note which should be attached to the doctrine that is set forth in the Schema de Ecclesia and is being put to a vote … On this occasion the Theological Commission makes reference to its Declaration of March 6, 1964, the text of which we transcribe here: “Taking conciliar custom into consideration and also the pastoral purpose of the present Council, the sacred Council defines as binding on the Church only those things in matters of faith and morals which it shall openly declare to be binding. The rest of the things which the sacred Council sets forth, inasmuch as they are the teaching of the Church’s supreme magisterium, ought to be accepted and embraced by each and every one of Christ’s faithful according to the mind of the sacred Council. The mind of the Council becomes known either from the matter treated or from its manner of speaking, in accordance with the norms of theological interpretation. Precisely zero. So, even though Archbishop Müller considers himself justified in speaking of the SSPX as if they are separated from the Church for their failure to accept as binding “all that was said in the Council,” when according to Archbishop Felici, no such obligation exists! This is yet another example of Archbishop Müller’s refusal to accept the judgment rendered by one who has “every title to deference” in the matter. Does this mean that nothing the Council states is binding? No, it simply means that every conciliar statement that is binding on Catholics, lest they risk formal separation from the Church, is binding thanks to the doctrinal weight such statements possessed even before the Council. This also means that it cannot be said that those who embrace all that the popes and ecumenical councils proposed for our belief before Vatican II are now somehow “separated” from the Church in its aftermath. This includes, of course, the Society of St. Pius X, who labor in the Church as true sons in spite of the injustice of doing so under a canonically irregular status. I agree with everything you said here except the very last line. It is said, all the time, that the SSPX are in a “canonically irregular status.” How so? The language used by Pope Benedict was “no canonical status.” How does “no canonical status” morph into an “irregular canonical status”? Where is the midpoint between nothing and something? This same line of “reasoning” pops up when considering the Pope’s additional words inviting the SSPX “to rediscover the path to full communion with the Church.” This has been dismissed by people I respect highly as meaningless because there is no such thing as “partial communion.” You are either “in communion” or you are “not in communion.” Isn’t it possible that the Pope’s words are a diplomatic way of saying that the SSPX are “not in communion” and “invited to rediscover the path to full communion” from which they have strayed? I pray for the SSPX to reconcile with Rome daily. Their “separation” — whatever terms one wants to use — is unspeakably painful. They have so much to offer the Church. But I don’t think it’s helpful to minimize reality by using terms like “irregular canonical status” when the clear words of Pope Benedict were “no canonical status.” There is something deficient in the SSPX response to Rome, and it has nothing to do with doctrine. Their use of terms like “New Rome” vis a vis “Eternal Rome” suggests what that is. Minimizing? Who implied canonical status is a small matter? I’m no canon lawyer, but invite any who wish to offer insight to do so. The SPPX bishops are truly bishops. Their priests are truly priests, their Mass is truly the Mass, etc. What they lack is licity, not validity, as their bishops lack jurisdiction in the Church which is given through the pope alone and the canonical status that goes with it. That’s as straightforward a representation of their status I can come up. Not in communion? That’s difficult to maintain. If embracing every single solitary doctrine of the faith as articulated before Vatican II, which changed nothing of the doctrine of the faith according to every pope since, doesn’t qualify, then what constitutes communion? I’m not saying that canonical status is a small matter. By “minimizing” I mean that because canonical status IS an important matter, it is important to take seriously the ramifications of a papal statement that says, clearly, “no canonical status.” To suggest that the SSPX have an actual canonical status, a status that is “irregular,” minimizes the gravity of the situation and, therefore, detracts from any sense of urgency to overcome the lack of canonical status. I said above that I agreed with everything you wrote except the last line. And I agree with you that the SSPX is fully Catholic in their doctrine. I am also aware of the insanity that says that Nancy Pelosi, or Sister Joan Chittister (and countless others) are in communion with the Church while the SSPX is not.. But the Pope did say that the SSPX are invited “to rediscover the path to full communion with the Church,” so there is SOMETHING about their communion with the Church that he judged lacking. Personally, I think that “something” is failure to submit humbly to the authority of the Roman Pontiff. Otherwise, why are there discussions between Rome and the SSPX, discussions which are judged necessary by both sides? I am not hostile to anything the SSPX teaches or does except that “minor detail” of not submitting to the authority of the Church. I respect their principled disobedience. I respect their appeal to St. Athanasius as the model for their stance. But I don’t agree with them here. They have become, in practice, a parallel Church that sits in judgment over what the rest of us judge to be the visible Catholic Church. That can’t be right. “No canonical status” seems appropriate” and “not in communion with the Church” seems an equally appropriate judgment. They need to “come home” and risk martyrdom, even if it’s at the hands of the Church. IMHO. Thanks for the conversation, Terry. I do appreciate it. If nothing else, Cardinal Castrillon’s quote is an indication of just how difficult it is to place a tidy label on this mess. It’s the result of a (thankfully) very unusual crisis resulting in large measure from the content of a highly unusual council. The labels matter less than the solution. No status? OK, fine. All concerned recognize their condition suffers from a defect that is serious. The situation is unusual, but not entirely unprecedented at the heart of the matter. It’s inaccurate to say that the Society accepts the pope’s authority only when they personally agree with him. Example: Athanasius publicly disagreed with Pope Liberius who had equivocated on Arianism. The latter condemned the former, and we both know which one is a saint! It happens. Popes can, and do, most certainly render judgments that we can’t accept. When? When they do not reflect the doctrine of the faith which can be known from the witness of tradition. Abp. Muller articulated the condition for the Society’s return: accept “all that the Council said as binding.” That ludicrous. If that’s the pope’s judgment as well, it’s still ludicrous. I, like anyone else who has explored the conciliar text in detail, would reject that offer out of hand as a matter of duty to the truth. It’s not an opinion based on personal taste, it’s based on nearly 2,000 years of Catholic tradition. That is a more accurate snapshot of where this stands. Pope John XXII said that no one attained the Beatific Vision until Judgement Day. He was wrong, of course and his successor, Pope Benedict XII, declared it doctrine that the saved see Heaven (and thus, God) before Judgment Day. So we respect the Pope as the successor to Peter. We don’t blindly believe everything he says. I’m glad the SSPX exists because without them, the FSSP would not exist. I will be happy, however, when they are in full communion with the Church. Thank you, Louie. I do hope you understand that this is truly a dialog between friends who love the Church. I know and dialog with some absolutely wonderful people who are very supportive of the SSPX. I do pray, daily as a Rosary intention, for a good resolution to this most unfortunate mess. We so need what the SSPX would bring to the Church. It’s terrible that the Church chooses to persecute THEM rather than those who work for Her destruction. The situation of the SSPX is a serious one, but there are so many MORE fish to fry! Than you, my friend! I appreciate your fervor and your input very much, Terry. Meanwhile, Nancy Pelosi is not ordained, though she may think…And never will be. Only Ordained leaders can be considered schismatics/excommunicated–precisely because they hold that much weight in their ordination! Absolutely vile, and so far removed from historical accuracy that it doesn’t merit further comment.